Review by AllTheBestFights.com: 2018-12-01, entertaining fight thanks to a good performance by both boxers and some tremendous shots: Deontay Wilder vs Tyson Fury is one of the best boxing fights of 2018 and it gets four stars! Both undefeated, the former Olympian and Wbc Hw champion Deontay Wilder entered this fight with a perfect record of 40-0-0 (39 KOs=98%) and he is ranked as the No.2 heavyweight in the world (currently the #1 in this division is Anthony Joshua) while his opponent, the former IBF, IBO, WBA and WBO Hw champ Tyson Fury, has an official boxing record of 27-0-0 (19 knockouts) and he entered as the No.5 in the same weight class. In their last three bouts Wilder has won over Gerald Washington (Wilder vs Washington), Bermane Stiverne (Deontay Wilder vs Bermane Stiverne 2) and Luis Ortiz (Deontay Wilder vs Luis Ortiz) while Fury has beat Wladimir Klitschko (in 2015, Wladimir Klitschko vs Tyson Fury), Sefer Seferi (Tyson Fury vs Sefer Seferi) and Francesco Pianeta in 2018 (Tyson Fury vs Francesco Pianeta). Wilder vs Fury is valid for the WBC World heavyweight title (Wilder’s seventh defense). Watch the video and rate this fight! 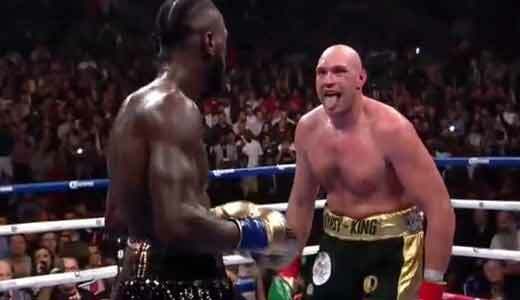 Review by AllTheBestFights.com: 2018-08-18, disappointing fight between Tyson Fury and Francesco Pianeta: it gets two stars. The undefeated former IBF, IBO, WBA, and WBO Hw champion Tyson Fury entered this fight with a pro boxing record of 26-0-0 (19 knockouts) and he is ranked as the No.5 heavyweight in the world (currently the #1 in this division is Anthony Joshua). In his last three fights he has beat Christian Hammer (Fury vs Hammer) and Wladimir Klitschko in 2015 (Wladimir Klitschko vs Tyson Fury) and, in 2018, Sefer Seferi (Tyson Fury vs Sefer Seferi). His opponent, Francesco Pianeta, has a record of 35-4-1 (21 knockouts) and he entered as the No.140 in the same weight class but he lost two out of his last three bouts, with Kevin Johnson and Petar Milas; between these two bouts he beat Daso Simeunovic. 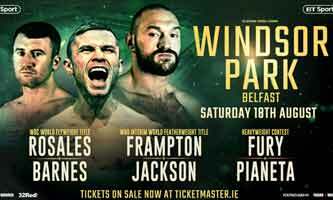 Fury vs Pianeta is on the undercard of Carl Frampton vs Luke Jackson. Watch the video and rate this fight! Review by AllTheBestFights.com: 2018-06-09, really disappointing fight between Tyson Fury and Sefer Seferi: it gets one star! The undefeated former IBF, IBO, WBA, and WBO Hw champion Tyson Fury entered this fight with a perfect record of 25-0-0 (18 knockouts) but he is not ranked as he hasn’t fought since November 28, 2015 when he defeated Wladimir Klitschko (Wladimir Klitschko vs Tyson Fury); before this bout, in 2015, he had beat also Christian Hammer (Fury vs Hammer). His opponent, Sefer Seferi, has a boxing record of 23-1-0 (21 KOs=91%) and he entered as the No.64 cruiserweight in the world. He suffered his only loss when he faced Manuel Charr in 2016, after this bout he has won over Marcelo Ferreira dos Santos and Laszlo Hubert. Fury vs Seferi is the main event of the evening. Watch the video and rate this fight! Review by AllTheBestFights.com: 2015-02-28, too much clinching and disappointing finish: Tyson Fury vs Christian Hammer gets two stars. The undefeated Tyson Fury entered this fight with a perfect boxing record of 23-0-0 (17 knockouts) and he is ranked as the No.5 heavyweight in the world (currently the #1 in this division is Wladimir Klitschko); he fought twice in 2014 beating Joey Abell (=Fury vs Abell) and Dereck Chisora in their rematch (=Chisora vs Fury 2). His opponent, Christian Hammer, has an official record of 17-3-0 (10 knockouts) and he entered as the No.11 in the same weight class; he suffered two consecutive losses in 2010, against Mariusz Wach and Taras Bidenko, since then he has won ten consecutive bouts, the last one against then-undefeated Irineu Beato Costa Junior (=Hammer vs Costa Junior). 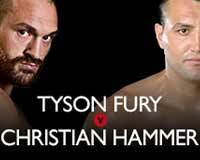 Fury vs Hammer is valid for the WBO International heavyweight title. Watch the video and rate this fight! On the original fight card Fury was expected to face the Argentinian Gonzalo Omar Basile but he withdrawn because of a lung infection and he has been replaced with the 32-year-old American Joey Abell who has an official record of 29-7-0 (28 KOs=96%). 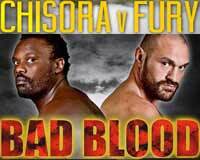 Fury vs Abell is the co-main event of Dereck Chisora vs Kevin Johnson. Watch the video and rate this fight! Review: 2013-04-20, entertaining start and good finish: Tyson Fury vs Steve Cunningham gets three stars. The undefeated Tyson Fury (20-0-0, 14 KOs) entered as the No.9 heavyweight in the world while Steve Cunningham (25-5-0, 12 KOs) entered as the No.12. Fury vs Cunningham, IBF heavyweight title eliminator. Watch the video! Review: 2012-12-01, good start between Tyson Fury and Kevin Johnson but then the pace slows down: two stars. The undefeated Tyson Fury (19-0-0) entered as the No.7 heavyweight in the world while Kevin Johnson (28-2-1) entered as the No.29. Fury vs Johnson, WBC heavyweight title eliminator. Watch the video! Review: 2012-07-07, nice fight and good pace for the heayweight division: Tyson Fury vs Vinny Maddalone gets three stars. The undefeated Tyson Fury ranked as the No.6 heavyweight in the world, entered the fight with a record of 18-0-0 while Vinny Maddalone had a record of 35-7-0. Fury vs Maddalone is the main event of the evening. Watch the video!